With our sketches we are staying with 2D only, the two dimensions of our papers. 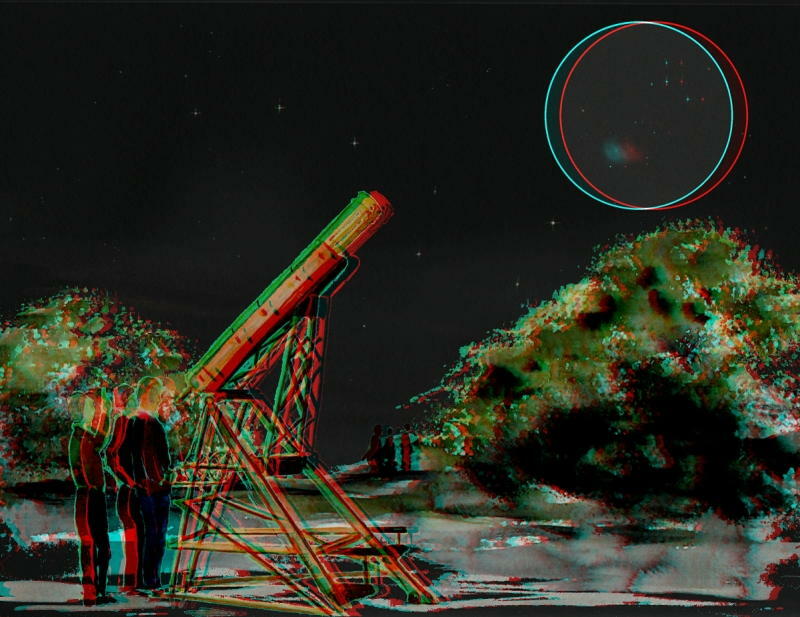 So, I project to reach 3D with anaglyph (cyan-red) glasses. It’s not so easy to make four watercolour layers, two inverted one naked eye for the sky and another through the eyepiece for the comet, plus two classical views one for the telescope and one for the landscape… and then compile all of them with stereo slip. But on top of that I want to reach another dimension, the time! Today, it was the good time to try that! This Lautter refractor, was build in 1830 ! The telescope and this lovely mount aren’t copies but originals. In the year 1830, the comet Jacques was very far from the today’s orbit. To give an idea of this 1830 old-time, we just invent photography and railway, the country of Belgium, the cities of Miami and Victoria doesn’t exist yet. That gives us an idea of the fourth dimension. The light coming from the comet Jacques was seen trough those very old lenses. The watercolours show this old lady refractor of Jean-Luc and Caroline, my friends from the “La Blaque” domain, near Varages in Provence. This antiquity was shown for the first time to the public during our yearly star party : august 2014 24th; what a success! I was lucky to receive some EP time (just 15 minutes) to sketch the comet Jacques. Regarding the long queue of curious waiting for a view of the comet I was quite happy. A diameter of 180mm f/d 15 with a 40mm eyepiece gives a magnification of 67X. The end time for the comet field was 21:45 UTC. To see the 3D effect of the second picture you have to use anaglyph glasses. Wow! This is very impressive and in 3D too. Very fine sketching and gteat looking old refractor scope. This had to be a great time. I do not understand how the hell you reached to do a 3D watercolor sketch but it’s amazing! This historic refractor is worthwhile to see! Next Next post: Running Jacques !! !